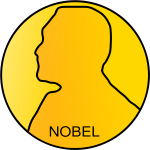 This file has been superseded by Image:Nobel.svg. Note: this file will not be deleted, unless it is explicitly nominated for deletion. This is a handdrawn symbol by the Italian wikipedia editor Gusme. Gusme has given permission for its use. See Nobel.svg on the Italian wikipedia.